Hoarwithy church was originally a chapel built in 1840 and when Prebendary William Poole was appointed vicar of the parish in 1854 he wanted to “beautify the chapel”. The result was the impressive Italianate Romanesque and Byzantine building designed by J.P. Seddon. A gem in rural Herefordshire with fine views from the top churchyard of the church and countryside. 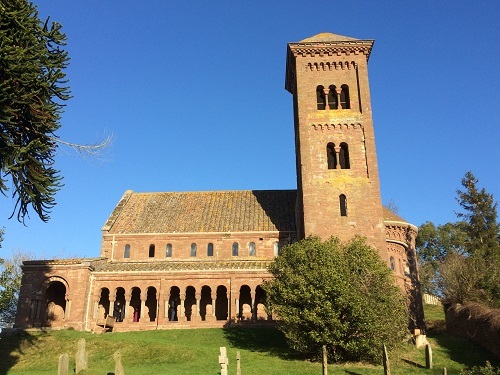 Inside there are wooden carved choir stall figures, marble columns and altar with lapis lazuli with the central cross made of tiger-eye, and a fine Burne-Jones window at the apex of the cluster of windows on the west wall. Over the altar there is a wonderful mosaic of Christ in glory and the hanging lamps are lit at Christmas. The conversion of an old building beside the church now provides a small meeting room, kitchen area and toilet which greatly helps as we welcome several groups of visitors throughout the year. The church is an excellent venue for concerts, with a fine acoustic. The stonework and masonry on the church tower has recently been restored with the help of grants from English Heritage and others. For more information about the church building, please visit the Visit Herefordshire Churches site or the Herefordshire Through Time site. For a few photos of the church, take a look at our Gallery page. Take the A49 from Ross towards Hereford. After the Pengethly Garden Centre and Pengethley Manor Hotel, take the next road on the right. Follow the road down to the river Wye, then left along the river for about two miles. Go straight through the village (don't turn off on any side road) and as you start climbing the hill you'll see the church gate on your left. Hoarwithy church is built high above the village, so be prepared for a (very worthwhile) bit of strenuous exercise getting up to it!